Wenn man Weltklasse-Musiker im Wohnzimmer hört, kann das eine Überraschung für sich werden. Ich könnte es so sagen: Das Konzert mit dem Trio Phoenix hat unseren selbstverständlich hohen Erwartungen nicht entsprochen. Es war einfach viel besser, als wir uns das bei der höchst eigenen Besetzung vorher vorstellen konnten. Wer gedacht hat (wie ich), das wird sicher etwas ganz Zartes und Feines werden, weil ja der Bass fehlt (arrrogantes Cellisten-Vorurteil), der hat sich ordentlich geirrt. Die drei haben mit einer mitreißenden Verve und einem unglaublichen Wumms völlig neue Klangfarben erzeugt. Die tolle Gitarre von Harold – von wegen, kein Bass! Eine Flöte, die schon auch mal wie ein Schlagzeug oder ein Saxophon klingen kann, und eine Bratsche, die genau so quertreiberische Sounds produziert, wie man sich das nur wünschen kann. So vielfältig, so ansteckend, so abwechslungsreich! Mayra will seither Flöte lernen, Alma meinte, sie nimmt das Instrument mit dem grünen Kleid… Viktor hat am längsten zugehört und favorisiert wohl die Gitarre. Ein durchschlagender, generationsübergreifender Erfolg! Danke an Lina, Xina und Harold! “On Tuesday night at the Ainslie Arts Centre, the youthful Kristian Winther (violin), Ioana Tache (violin), Alexina Hawkins (viola) and Thomas Marlin (cello) gave a concert titled be:longing/Shostakovich and played music by Purcell and Tchaikovsky, (with guests David Pereira and Tor Fromyhr) culminating in a breathtaking performance of Dmitri Shostakovich’s Third String Quartet. Alexina Hawkins’s viola is a vessel for reaching out and engaging with her network of musicians and creators. Eschewing the South Melbourne Town Hall for the cavernous ceiling and broad windows of the BRIGHTSPACE gallery in St Kilda, the expansive, final concert of Hawkins’ ANAM fellowship included an improvisation on water by percussionist Thea Rossen and an exciting new work for massed violas by Samuel Smith. Continuum II by Nicoleta Chatzopoulou begins with axiomatic statements of different types of articulation: Legato bowing, tapping the body of the instrument, tremoli. As the piece develops we are treated to glorious chorale textures decorated with harmonics, glissandi, and double-stops that resonated beautifully in the room. This piece was a lesson in the timbral possibilities of the instrument, setting the stage for the massed violas to come. But not before the audience was gently ambushed by the percussionist Thea Rossen. Rossen began her liquid improvisation behind one of the gallery’s partitions. The singing tone of a hydrophone called from afar before growing nearer as Rossen moved through the audience. Like a ritual procession, she eventually reached a bowl of water brilliantly lit from below. Here the spell was broken as Rossen conjured a series of slapping noises from the water. One sound caught the ear: the sharp attacks produced by flicking the water with the thumb and forefingers. Emerging from studies with Larry Sitsky and Elliott Gyger, Samuel Smith is one of Australia’s most sought-after young composers. Over the past months he has been busy composing for Ensemble Offspring, Soundstream Collective, and the Melbourne Symphony Orchestra. His piece for seven violas premiered in Hawkins’ concert joins pieces for massed violas by Peter de Jager and Brett Dean performed throughout Hawkins’ fellowship. As I claimed earlier, massed violas are incredible vehicles for contemporary music. In elsewhere; everywhere Smith wastes no time in pushing the instrument to its limits. One viola breaks into a finely-detailed solo of rapid string crossings; light whispering bowing, crunchy double-stops, sotto-voce trills, and harmonics. The solo is a piece on its own, a polyphony of timbres on one instrument with swishing up-bows like a samurai sword. Two more violists seamlessly join in, producing a fluid texture of sirens crashing into grinding, heavy bows on the lower strings. The piece is so linked to breath and motion that I feel it could be arranged for a vocal ensemble. Once the ensemble grows to more than three voices, the piece becomes less convincing. Four violists face each other on either side of the trio. Their antiphonal imitation is obvious and repetitious, though moments where the entire ensemble contrast with solo voices are positively sublime. At one point Smith pits a Xenakian chorus of glissandi against one tough little solo voice. Evan Lawson’s broad conducting was perfect for the massive, pitching rollercoaster of sound. Smith quits while he is ahead. The ensemble puts their mutes on to finish and I was left thinking I could have heard more, which is always a good thing. Hawkins ended with the solo piece Light is Calling by Bang on a Can co-founder Michael Gordon. Light is Calling is an exhausted appeal to beauty after the events of September 11. The solo violin (here viola) plays sustained, plaintive tones against an electroacoustic track of reversed guitar sounds. Hawkins articulated her line with more vibrato and dynamic phrasing than Véronique Serret during the recent Metropolis New Music Festival. Serret’s interpretation produced an atmosphere of angelic serenity, but Hawkins may have opted for a more dynamic interpretation because she was not playing against Bill Morrison’s accompanying film. Spectrum, like all of Hawkins’ ANAM fellowship concerts, showcases her collaborative nous, artistic vision, and instrumental virtuosity. The effervescent violist Xina Hawkins has returned from her stellar international career to present three concerts of music for solo and massed violas at the South Melbourne Town Hall. Peter de Jager, Brett Dean, and Samuel Smith have been engaged to compose for viola ensembles, and if De Jager’s offering is anything to go by, we are in for some valuable new repertoire for an often ignored instrument. But before we heard De Jager’s Metaphors, Hawkins had a few surprises in store. First up, an imaginative piece for viola and piano by Paul Kerekes. The innocuous-sounding Four Pieces contains four far-from-innocuous movements. The first is inspired by the cartoons of Michael Leunig and features whimsical descending chromatic scales and the sort of minimalist rhythmic pitter-patter associated with innocence and blue skies in film scores. The final cadence leaves us with the pathos that so defines Leunig’s social commentaries. Kerekes gives us more pitter-patter in a movement inspired by hyper-organised supermarkets before moving attacca into “Aviophobia,” a movement depicting the fear of flying. Hawkins dug deep for this one, crafting soaring glissandi over piano tremoli. The final movement is inspired by “Michael Jackson and Ligeti,” a combination that works quite well. Kerekes combines Ligeti’s rolled clusters with syncopated, vamping bass lines. Citing “unfinished business,” Hawkins and Jacob Abela launched into a rendition of “Billie Jean.” The audience clicked out the song’s cross-rhythm and their enjoyment of Hawkins’ performance was evinced by their degree of rhythmic inaccuracy in the chorus. Hawkins was then joined by double bassist Kinga Janiszewski, percussionist Hamish Upton, and oud player Yuval Ashkar for an extended Taqsim, or improvisation based on Arabic modes. The improvisation included the traditional song “Lamma bada yatathanna,” as well as an original song Marakesh Nights by Ashkar, which were framed by beatific improvisations. Peter de Jager is the piano virtuoso of his generation. As a composer, too, he exhibits an almost incontinent imagination and creative felicity. I have found that his cellular, fragmented forms do not always amount to more than the sum of their parts. He is a pianist’s composer and the piano part can dominate within his ensemble pieces. The answer, we discovered on Tuesday night, is to take him away from the piano. Metaphors for nine violas presents so many unprecedented textures and effects, as well as familiar sounds presented in a new light. The piece is a beautiful synthesis of inspiration and craft. The piece’s nine parts may suggest a disjointed series of studies. However, De Jager introduces a sense of continuity by increasing the number of violas in each movement from the microtonal solo “Ladder” to the nonet “Fugue, Chorale and Toccata.” Each movement is a work of astonishing refinement and control. “Stars” is a case in point. Reading the generic description “extremely high harmonics as twinkling points of light” I expected the piece to come and go without too much interest, but no. The three violists appear like a constellation on the far side of the stage from the previous duo. Their harmonics are very close and rhythmically overlapping, as though one were listening to distant interstellar patterns of morse code. The richness of the viola’s harmonics give a personal warmth to these starry sentinels and their peculiar harmony. The following movement, “Planes,” is another aural delight. The viola quartet play loud, diverging glissandi reminiscent of Xenakis’ Metastaseis. These planes are “connected” by solo scalar runs. At first the planes are low and dense, but soon they rise higher in pitch-space. Then there are more simultaneous planes with multiple scalar stairways leading from them. The effect is extremely visual, and it’s a pleasure to follow De Jager’s Monument Valley-esque world of planes and bridges in the mind’s eye. The final movement of Part I is a solo melody inspired by traditional Arabic music. The melody shows an intense melodic sensitivity on De Jager’s part, but the background texture is just as striking. I am not sure exactly how it is produced, but the six violas produce a rich, whispering, murmuring background that I had never heard before. Part II features movements with a more diverse use of texture. “Forest” begins with eight violas playing trills with all fingers on open strings while changing their tone by moving their bows between the fingerboard and the bridge. Once again, De Jager takes a conventional enough technique and uses it to produce a sublime, sussurating effect like wind in the trees. After a while “gnarled branches” jut out of the foliage. The effect was all the more surprising after the long period of static rustling. The final movement was an experiment in nine voices and three traditional textures. The fugual section lost clarity after five or so entries, not so the super-juicy nine-voice chorale of stacked seconds, which the ensemble balanced finely. The final, hocketing toccata was a great example of ensemble dynamics, with the final chord echoing out beautifully into the South Melbourne Town Hall. I can’t wait to hear what violist and composer Brett Dean (recipient of last night’s Art Music Award for orchestral work of the year) and rising star Samuel Smith have in store. 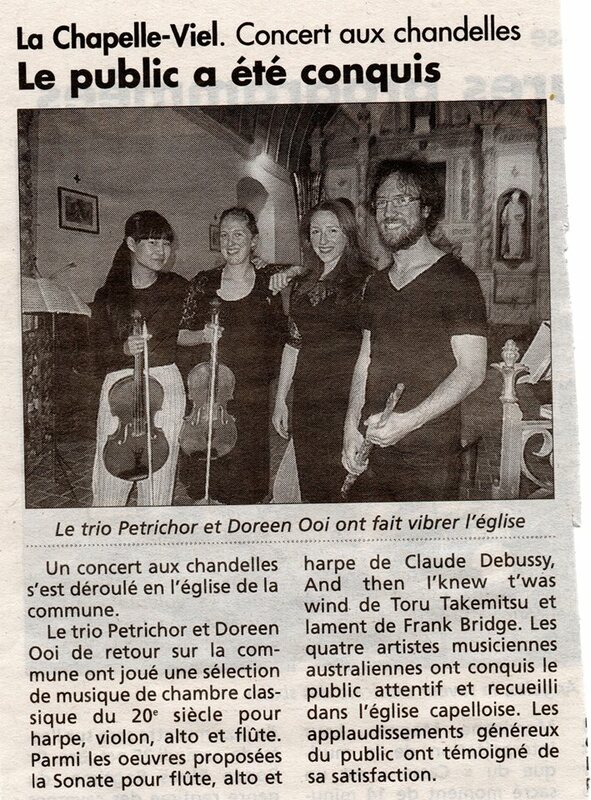 “The trio Petrichor and Doreen Ooi rocked the church”! NORTH ADAMS — On Thursday at around 9 p.m., darkness fell on Mass MoCA. Not a casual darkness, but a darkness so deep and so pristine I could not see my own hand in front of my face. The lights went out, more precisely, in a windowless gallery on the second floor of the museum’s main building. The walls instantly disappeared. The audience members around me disappeared. The four musicians disappeared. And so did a man seated about 6 feet to my left with gray hair and a kind, bespectacled face. One might imagine this particular man, for at least a fleeting moment, smiling in the darkness, because if it’s possible to call any darkness proprietary, then we might say this was his darkness. He had written it into the score of his Third String Quartet, “In iij. Noct.” He is the composer Georg Friedrich Haas. Once described as a “researcher into the inner world of sound,” Haas has built an intensely curious following in recent years through works such as “in vain” and the Third Quartet, in which darkness becomes not only a compositional device, but also a kind of catalyst for exploring a metaphysics of perception, and a way of radically re-sensitizing the ears. And it is indeed hard to find words for the disorienting strangeness and pulse-quickening exhilaration of listening to this work in live performance. This is, among other things, music about sound itself, music about the way we hear music. Haas calls for the four string players to be seated as far apart as possible in the room, so they are communicating only through the sound they create. After the lights go down, the audience sits in silence, and anyone uncomfortable is given a chance to leave. This is not an idle invitation. At Thursday’s performance — part of the Bang on a Can Summer Music Festival — the room was so dark and so densely packed, that, as if from some deep evolutionary place, one’s nervous system senses danger. For a few seconds, the adrenaline pumps. Fortunately, it was not long after this that the first sounds arrived, slipping in quietly, like some nocturnal rustlings in a forest of the mind. Over the next hour — which passed in what felt like about 20 minutes — we heard a menagerie of sounds quivering on the border between music and noise: plucked string attacks, high-pitched instrumental shrieks, a snippet of a Gesualdo melody, interlocked plummeting lines suggesting an enormous machine powering down, and music that seemed to reverse the flow through passages of incessantly rising notes, suggesting a bubble of air surging upward from the ocean floor. Haas has the individual musicians playing at times as an ensemble, and at times speaking only to themselves, trailing off into the void. And yet descriptions like these don’t suffice, in part because of how completely the listening environment transforms the experience. Darkness is not extrinsic to this music, but part of its DNA. The same effect could not be obtained by simply closing one’s eyes to a Beethoven quartet, or, as a skeptic might naturally wonder, through some self-administered experiments in dorm-room psychedelia. Haas’s spectralist music focuses attention on the granular materials of sound itself: microtones and overtones, intervals of consonance and dissonance. Yet so thoroughly are the building blocks broken down that once they are reassembled, they carry a kind of electric charge. This piece also brims with private emotion. The idea first came to Haas, as he explained in brief comments to the audience, when he was traveling on a train in Austria to view his gravely sick father for what he thought might be the last time. In other words, this music has its origins in a moment of intense interiority that nonetheless took place in a resolutely public space. Haas has likewise here created a musical experience where, seated in a crowd, you are in fact profoundly alone. Stripped of visual defenses, one listens from a more vulnerable stratum of the self. And because one’s own body, too, has vanished in the dark, you hold fast to the sounds of these instruments to avoid a kind of existential quicksand, a terror that lies just beyond the edges of this music. In this sense, you are aligned with the musicians as they navigate this score, gesturing out in the darkness toward one another, suggesting, if only metaphorically, a modern subjectivity as a kind of echolocation of the soul. On Thursday night, after the last sounds died away, there was a long silence and then, as the light slowly returned to the room, an applause that grew thunderous. The performers, for whom this outpouring was well-deserved, were Lili Sarayrah and Lauren Cauley (violins), Alexina Hawkins (viola), and Lauren Radnofsky (cello).